Welcome! I’m back to rate those nicknames you gave for Spinarak and Ariados! But please, stop waving those things at me. It’s not that I’m scared of spiders, honest! It’s just that I’m scared of, uh, them biting me. On the face. Nicknames for Pidove, Tranquil and Unfezant! Now it’s time for nicknames for the Pidove line, following the article we wrote on it! 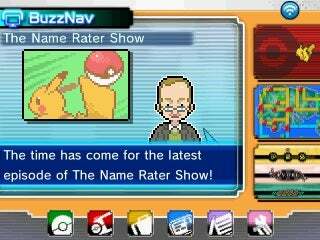 After all, the Name Rater wants to see what you have to offer. He’s been twiddling his thumbs over an old discarded phone book, so we feel he could use the distraction of some names to rate. Leave a comment suggesting a name or few for each of these Pokemon, and perhaps why you came up with those names as well. Maybe other readers will like your suggestions and use them in their games, after all! You have at least a week to do so before the Name Rater casts his judgement, so get them in! Welcome! Here I am, the… Name Rater. Yes, that’s who I am, I think. Before I do these name rates, I wish to clarify that I was NOT talking to jars of pickles, and certainly not because I am lonely! No, I was just… reading their nutritional content labels out loud, is all. Now then! The Lotad line? Let’s do this. Nicknames for Lotad, Lombre and Ludicolo! A while ago, we wrote the article on the Lotad line, and now the Name Rater wants to see what you can come up with in regards to names for these Pokémon! After all, he’s gotten rather bored with the lack of names to rate since the naming of Wyatt, our Wynaut mascot. He’s even been seen talking to jars of pickles to help pass the time. Leave a comment suggesting a name or few for each of these Pokemon. You have at least a week to do so, so get them in! EDIT: Now closed! If you wish to see the names below rated, click the next article link at the top of the page! So there’s less than a day left with voting for the name of our mascot! But until then let the Name Rater tide you over with his personal opinions on your submissions! Rightio, ladies and gents. It’s time for me, the wonderful… uh. Hang on, who am I again? …Oh! That’s right! I am the Name Rater. I’m here to give my opinion on these nicknames for the Pokemon Wynaut submitted to this magazine, called…called… whatever it is I’m sure it’s nice. You say this Wynaut is a reporter sort, eh? Well, let’s see if any of these suit it! The Magazine Mascot Needs a Name! Current readers will notice a change to the site; the banner at the top has changed to show off the mascot! Courtesy of An-chan for the Wynaut and Bay Alexison for the snazzy banner. The mascot may not be surprising, but it’s not just a Wynaut, it’s a journalist Wynaut, at your service! And it desperately needs a name. After all, nicknames are all the rage these days, but we’ve been recently banned from the Name Rater’s house after asking one too many times about his opinion on our frankly amazing nicknames which he didn’t share the opinion of. Hehe, Bobbaffet. You’ll never get old. Thing is though business is slow for the Name Rater these days, and to make it up to him we decided to allow him some employment opportunity! That’s right – the Name Rater wants YOU! Either comment here or on the forums with nicknames idea for the Pokemon we just analysed in Wynaut and Wobbuffet, and he’ll rate them for you! Be warned though that he’s a bit grumpy. Just a bit. Meanwhile, we’re having a competition to the name the mascot. This is how it’ll go: you can post in the fancy forum thread or here via a comment to suggest a name – or two, if you so please – and then we post all those names as a poll and choose a name for the lil’ fellow like that. Makes sense, no? And to make it fun some guy in a hat will make fun of your nicknaming ability. So what are you waiting for!? You have a week, two max to get those suggestions in!